This week has been wonderful and so busy. We are getting into routine, everyone has transitioned very well and we all have become very understanding of each other's needs. We are incorporating family style lunch so that we can spend more time with each other and also learn patience and the concept of turn taking. We first introduced it with only Cleo, Una and Antoine as their schedules were similar, but now even Teagan has joined in. And Annabelle and Lucy have their bottles at their time. So it is perfect as we all are eating/drinking at the same time. While we are feeding our friends the others are very patient and wait for their turn or say "more" or use their sign language. They do not shout or scream anymore when they want their food. We have started the sign language of "more" and "all done" with Teagan and Annabelle too as they have started eating their solids. Our friends are getting better and better at messy play and doing activities. Our goal for this week was to focus on introducing colors as they come across those colors every single day. Our friends are starting to recognize red, blue and purple. We identify these three colors even when we are outside so they associate these colors in the real world too and is just not restricted to our classroom. As we all know spring market is approaching soon and every class has a different plan for the market. (Surprise for our families). We already have done our first step towards it and painted a poster board with a lot of colors. It looks amazing. And our class is going to make two things to sell for the market. 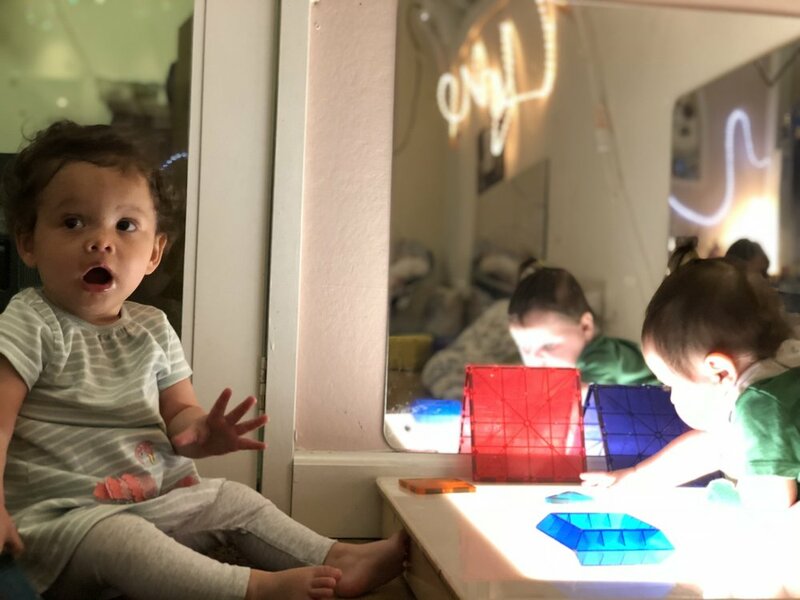 Our friends again seem to gravitate a lot towards the light table and explore the Magna tiles. 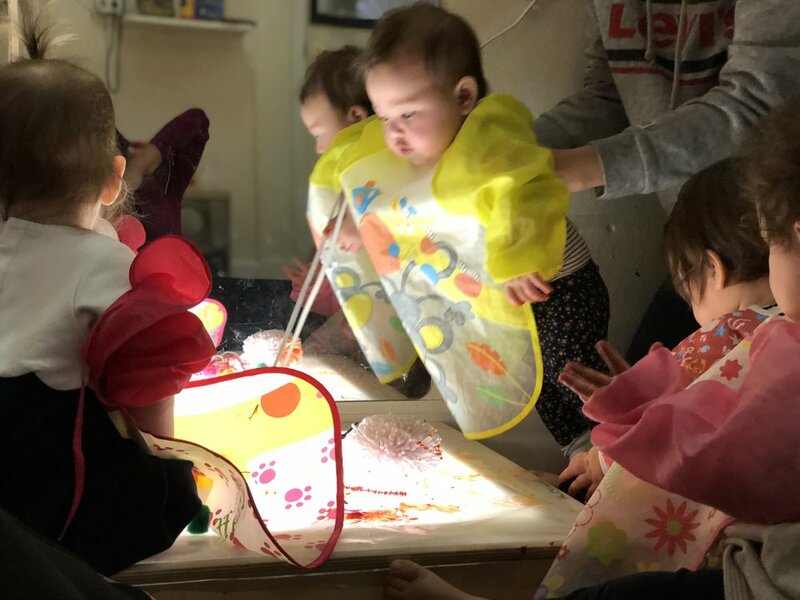 As they are again interested in the light table, we decided to do an activity on it on Monday and they all enjoyed it as it was on the light table, there are mirrors and they liked the stickiness of the contact paper. The activity that we did was- sticking feathers, pipe cleaners, pom-poms and paint on the contact paper. They seemed to be fascinated by the feathers as they were exploring them for the first time in school. Annabelle and Teagan enjoyed sitting on it and feeling the stickiness. We have been making a conscious effort to go to the gym everyday. Our friends have started playing with each other, and while playing they are being mindful about their actions and even involve Annabelle, Teagan, and Lucy in their play. On Tuesday, we decided to paint our initials and start recognizing our initial letter. We really liked the Carly used to sing to Annabelle- A is for astronaut and b is for baba. She associated letters with different words and we started doing the same and used their names whenever their letter came. The reason we used purple to paint is because that is our focus. On Wednesday, we decided to explore shaving cream with finger paint. We have always explored shaving cream with tempre paint but this time it was different. Some of them liked how it felt, some of them did not prefer it. It was a short activity as they got over it soon. On Thursday, we decided to go out at 9:00 am in the morning as it is a good time to go out before it starts getting too hot and before our friends start to fall asleep. Thank you to all the dad's who were here during drop off to help us apply sun block, put their hats on and put them in the strollers. It was a great help. It was really nice to have Shaun until mid way and DJ accompanied us all the way to the park and spent time with us there. It is always wonderful to have our families join. This routine was helpful as our friends came back and slept and everything went very smoothly. On Friday we followed the same routine of going outside at 9:00 am and today it was a longer walk. We were outside for almost 45 minutes. Thank you families for applying sun block and bringing our friends. We were able to go out a little before 9:00 because of such a great help. We explored different types of fabrics today. They were exploring these for a long time. Most of them felt different, were different colors too. Thank you for all your help and support. Have a wonderful weekend.